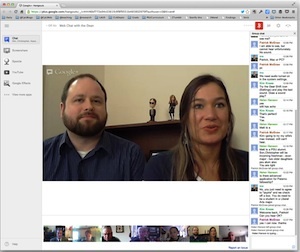 Google+ Hangouts is video chat for groups. Hangouts can accommodate up to 10 people at once, with room for others to watch. But you can also use it to chat one on one. Best of all it’s free and easy to useYou can use Hangouts on a desktop computer, laptop, mobile phone or tablet. When it comes to sharing information with clients and colleagues, teaching and learning, Hangouts can be used in a range of different ways to improve communication and connectedness. You no longer have to wait for that annual conference to catch up with colleagues you haven’t seen all year. Use Hangouts to connect with people who do work like yours in different parts of Australia or around the world. Watch someone else in action. Perhaps you’re teaching a new group and want some advice from someone who’s more experienced, or you’d like to see how they work with a similar group or topic. Use Hangouts to demonstrate how to do something or pass on information in an engaging way. You can use Slideshare to support a public talk or to give practical examples of your topic. Hangouts can be particularly useful if finding a convenient meeting time is difficult or when you want to include people who might not be able to attend. Scheduling a Hangout can be a useful way to overcome problems of distance or mobility and to include all community members in discussions. You can invite anyone from around the world to talk to your group. Whether it’s a poet in Paris or a birdwatcher in Berlin, you can use the technology to bring them into your group. You might want to capture the experiences of your learners or gather testimonials about your service. By recording video interviews you can upload these to your website or share them with members of your organisation. You can collaborate on documents during your meeting. Google Drive allows you to work on documents while you’re meeting so that you can draft and then discuss them face to face. Talk with prospective users of your service or keep in touch with former participants by scheduling time where they talk with you or other staff at a specified Hangout time. We’d love to hear how you use Google+ Hangouts. Visit our Facebook page and tell us how you are using it in your organisation.